Ben and Jen’s house once suffered the shortcomings of a typically compromised Brisbane worker’s cottage. 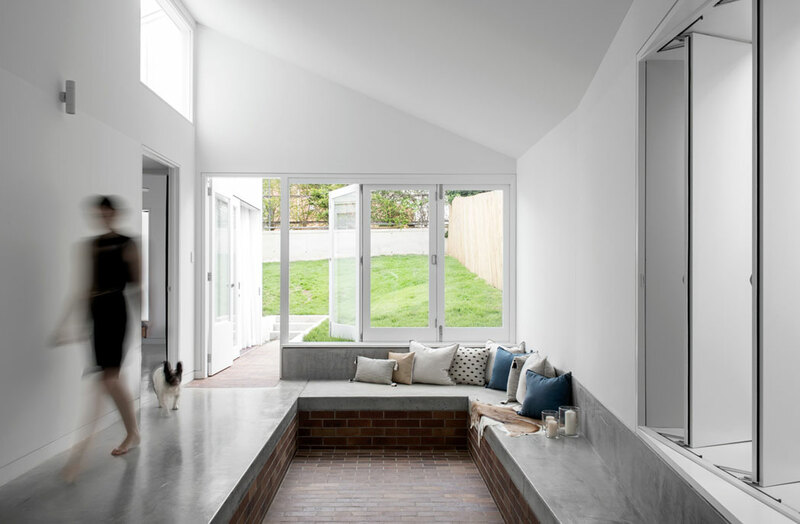 Poorly considered additions carried out by previous owners offered more space than the traditional four rooms, but had resulted in a living environment that provided little thermal comfort and failed to address the need for flexible, indoor/outdoor gathering space. For architectural practice, Myers Ellyett tackling such an alteration and addition was a two-fold challenge. 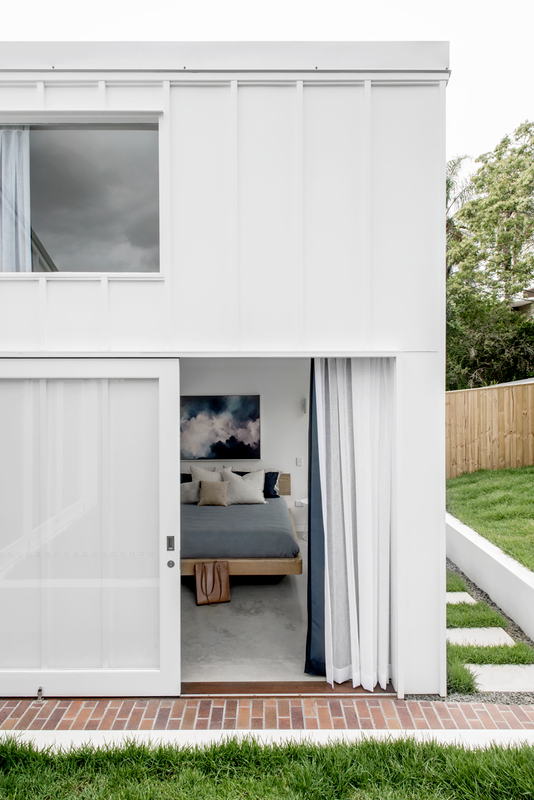 It involved removing offending additions to express the vernacular building in a historically sensitive way while creating new additions to support a contemporary inner-suburban lifestyle. The sloping site, a continuation of Red Hill’s undulating topography, offered the designers their first clue. Director, Bill Ellyett explains, “A lot of our projects start with the ‘stereotomics’ or an idea of making a terrain that is carved out of the ground plane with something lighter that sits on top.” As a means to reconnect the cottage to the sloping site with which it collides level at the rear, a new manmade terrain or floor was conceived as an internalised landscape, forged in concrete and masonry. This concept translated the juxtaposition of the creaky timber floors of the old, and the cool monolithic platform of the new, into a sensory experience that could be registered underfoot. 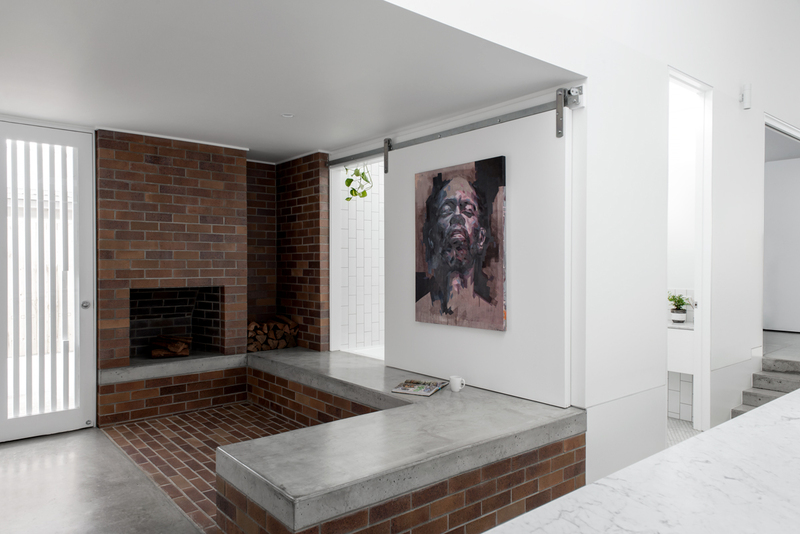 The use of black and tan brick gives new spaces, dedicated to gathering, a semi-outdoor quality. 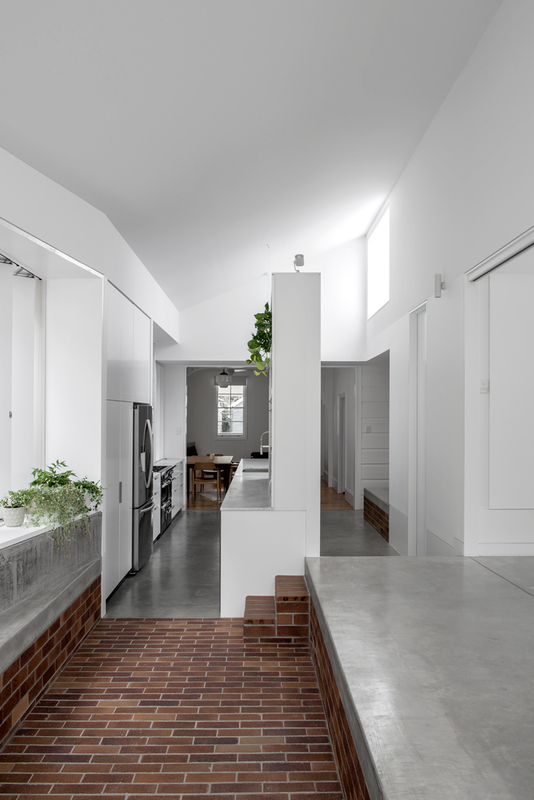 Combined with the kitchen and scullery, these social rooms make up the opened planned spaces that form an ‘L’ shape around new sleeping chambers. A terraced level change enhances the distinction between public and private areas and sets the height of the fixed plinth seating, which establishes a sense of containment within each sitting room. The result is a suite of spaces that are playful, robust and accommodating of almost any size and type of gathering. 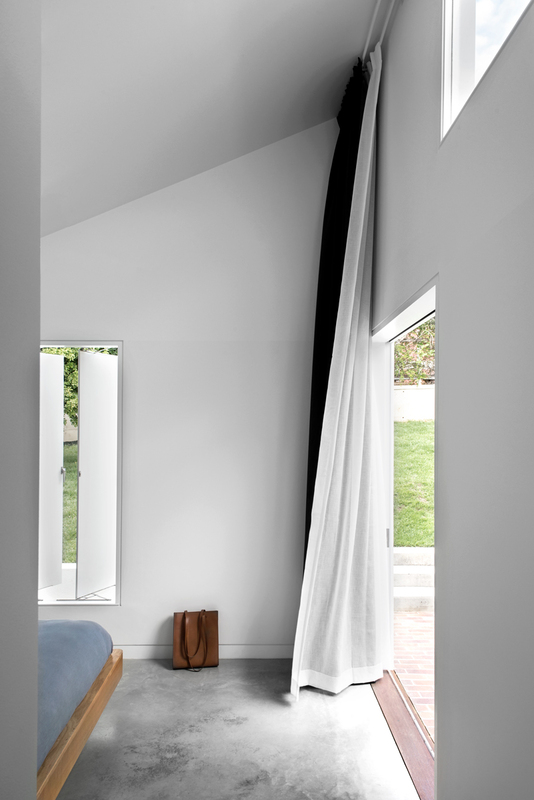 While the floor is considered a manipulation of a solid mass, the walls and ceilings are conceived as containers for light and a canvas for shadow. The vertical volume offsets the modest dimensions of the footprint to give the new interior a greater sense of spaciousness. High-level picture windows frame sky views and allow northern light to illuminate the combined spaces of the interior positioned on the southern side of the plan. Air is drawn in at the building’s sides, through solid shutter windows that establish a regular, vertical rhythm. At the back of the house, coinciding with the eastern side of the terrace, casement windows allow the backyard to merge visually with the terrace interior. The kitchen acts as a bridge between sitting room and terrace, and fully capitalises on its galley arrangement to encourage lineal movement through the house — from front to back. 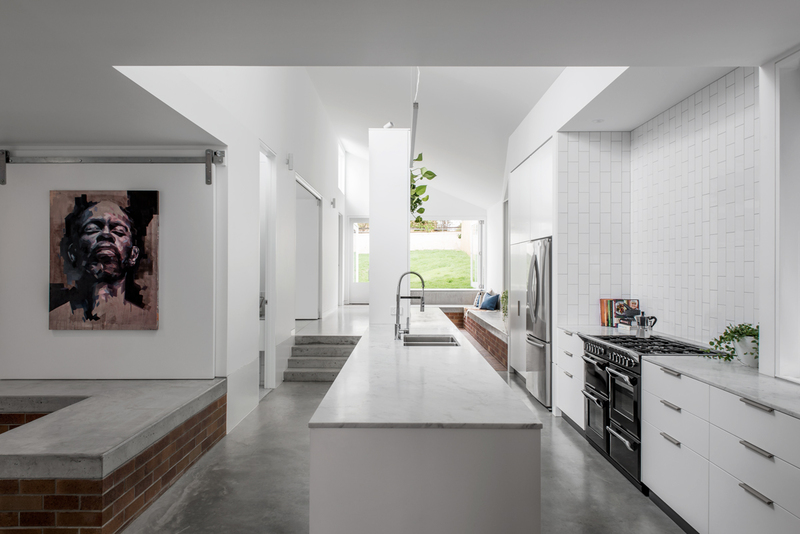 The scullery is designed to function as a ‘small room within an open plan’ offering a subtle division between the public and private sides of the house. The tall joinery unit is deliberately stretched vertically to intensify the sunken quality of the terrace, encouraging occupants to feel contained by the hillside. 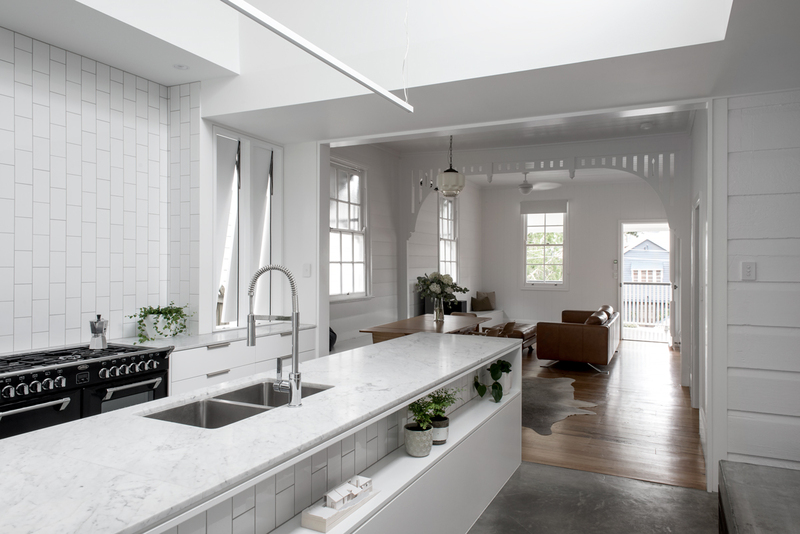 The marble benchtops and simple white surfaces further exaggerate the pure spatial expression and almost scale-less quality of these spaces. 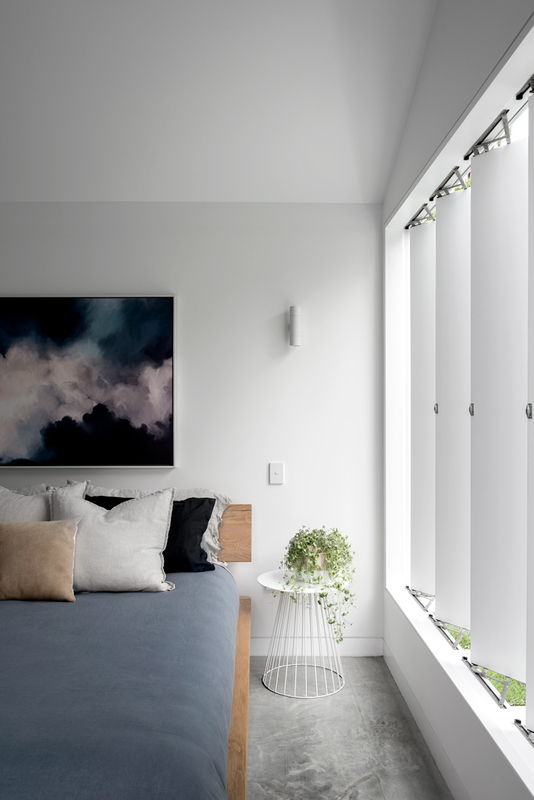 What is particularly striking about the quality of the interior is the abundance and consistency of natural light despite the lack of window glazing. With the exception of the casement windows on the eastern elevation, there are no transparent openings at eye level and this adds to the cavernous effect of the space. 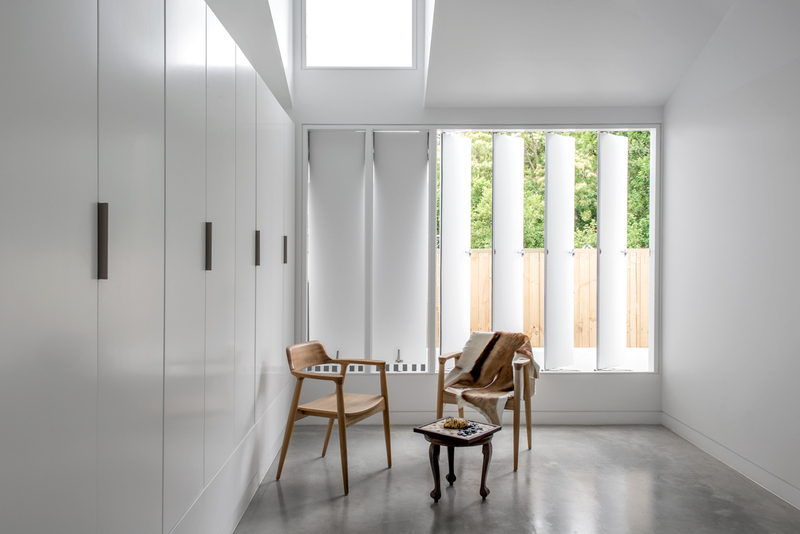 Instead light is introduced vertically through ‘cracks’ between solid shutter windows and through the fixed glass and light shelves positioned at height level. 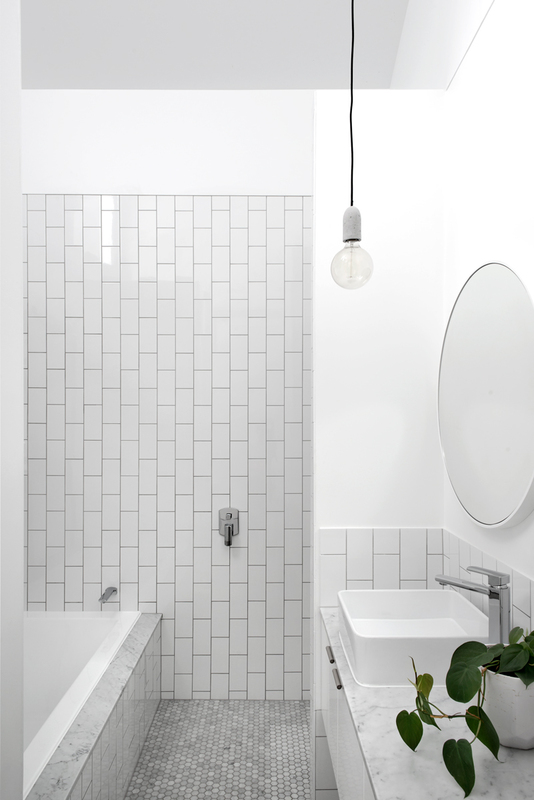 The effect is most apparent in the bathroom and en-suite where there are no windows and only a single skylight. In these spaces a further abstraction of the landscape is made with high-level ledges supporting an elevated fernery and a delicate green trim to enliven a muted colour palette of white and grey. 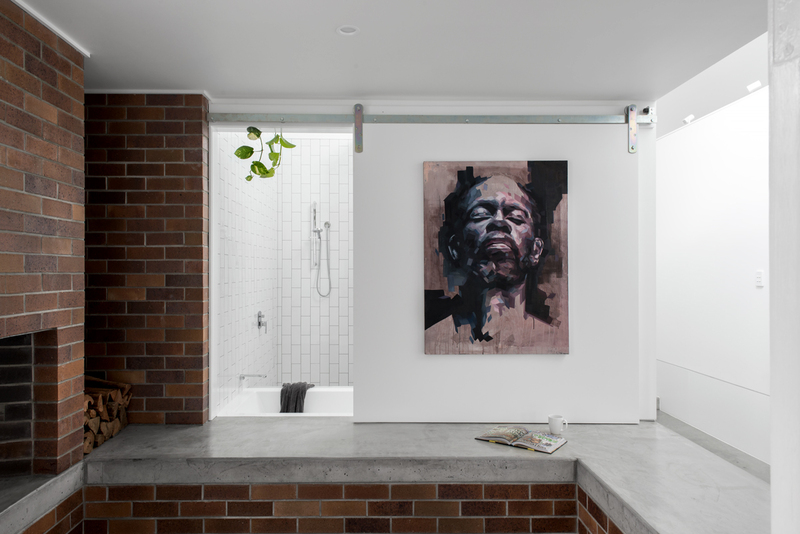 Perhaps the most arresting outcome of the project translates in the casual ways that rooms and spaces now coalesce – the way the sliding wall separating the bathroom and sitting room discreetly enables the fireplace to be appreciated from the bathtub, for example. 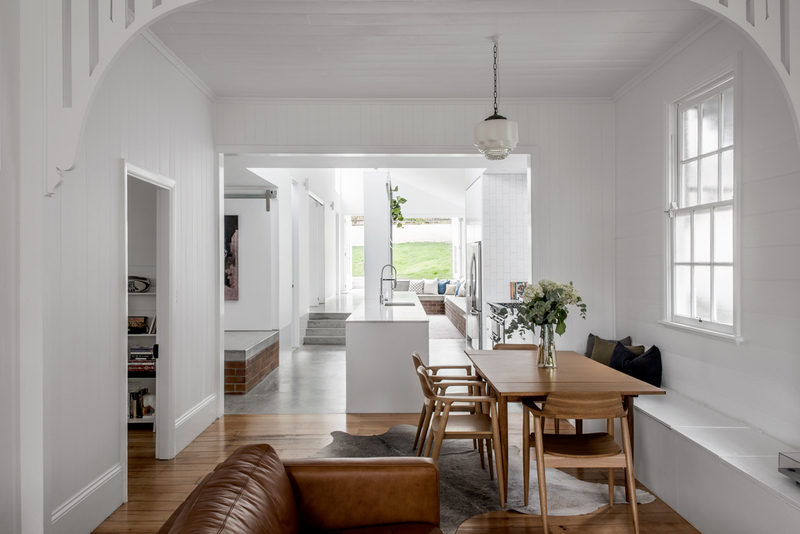 Ben and Jen appreciate the rebirth of their once compromised cottage, reflected in the return of the front verandah and central corridor, and the sensitive acknowledgement of the scale, character and materiality of the historical built fabric. What they find most gratifying are simple things like returning home and engaging in the ritual of mealtime, conversation and gathering in a place that is hugely enhanced by the unconventional and sublime ‘landscape’ of the interior. This article originally appeared in inside 96 – available here or digitally through Zinio. 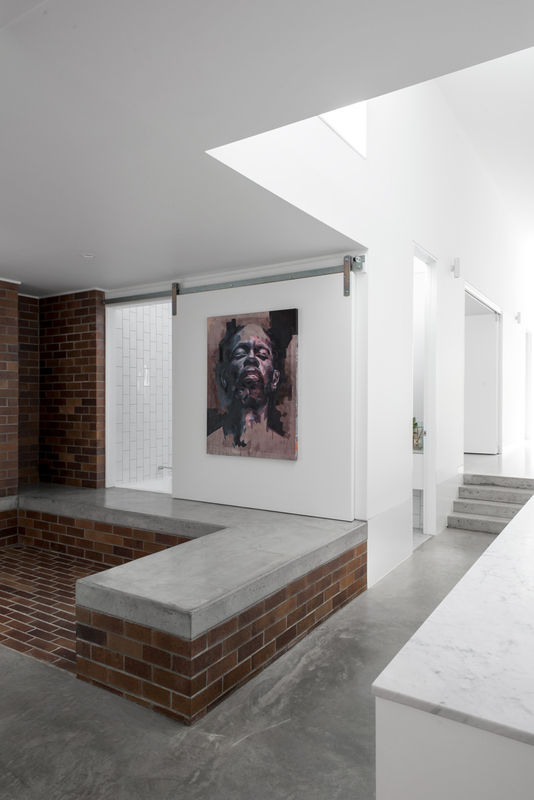 Check out this incredible home by SJB.